Do you Want to Factory Reset Playstation 4,If yes, You might have fallen in a situation, whereby you decides to start from scratch or probably, upgrade to PlayStation 4 Pro or there is an error you are trying to fix. Or you are trouble testing the latest PlayStation software update. In any of these mentioned cases above, requires you to perform a factory reset for instant solution. A factory reset wipes the console hard drive and can even remove its system software. 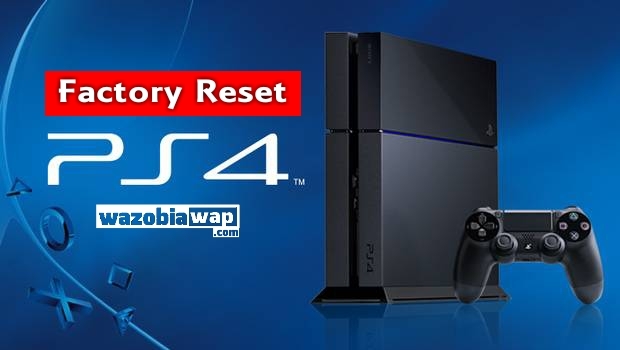 There are two main ways to perform a factory reset on Playstation 4, is either you go through the safe mode or the PS4 dashboard, which you should consider if the console is having boot-up issues. Before you proceed, make sure you backup your files in cloud or anywhere in order not to lose any of them when resetting is done. Firstly, deactivate your PS4 account by signing in to your settings MENU. Go to Network/Account Management and you will find Activate as your primary PS4 option, kindly Deactivate. Sign back in u=with your user account, which is different from your PS4 account. Then go to Settings > Initialization and you will found two options where the first one is to return your PS4 to the factory state but will not delete your hard drive while the second option, is to delete and wipe out your files and even make your PS4 look as if it was just bought new. If you are have error preventing you from entering settings menu, you can use safe mode method to perform the factory reset. Now, you choose the reset option you need; Restore Default Settings or Initialize PS4 to wipe the hard drive and restore to factory settings while keeping the system software.